The Somuta Bridge is a two simple span precast I girder bridge on a hammerhead pierwall. It has a stone facade on the exterior girders, decorative barrier rials and lampposts, and sculptures and plaques on the deck. The care that was taken to make these simple bridges beautiful reflects the respect the Japanese have for their rivers. These bridges look like they were built in the early 1990s and they all show signs of damage from the flood that occurred in 1993. 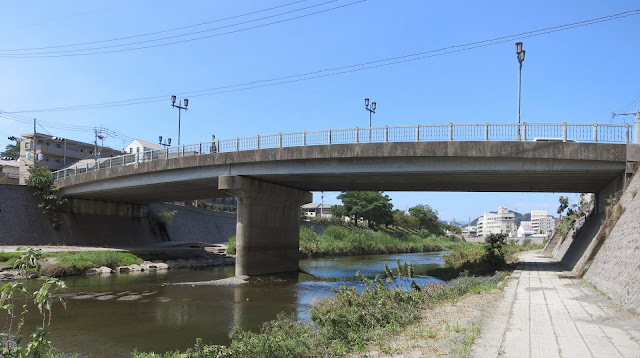 Kagoshima Prefecture, Japan's Bridges: Somuta Bridge across the Kotsuki River by Mark Yashinsky is licensed under a Creative Commons Attribution-NonCommercial-NoDerivs 3.0 Unported License.